Fun and whimsical, these high quality Silver and Gold plated key chains are perfect for the dog lover. 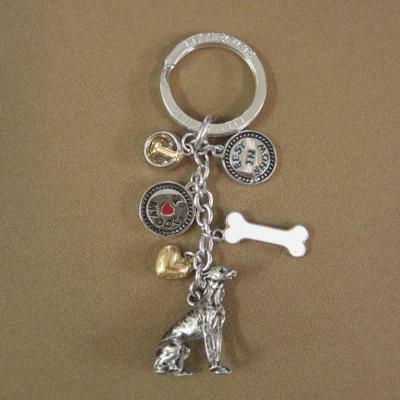 Each key chain has 4 charms, Dog Bowl with gold bone, "I love my Dog", White Dog Bone, and a Gold heart. In addition there is a specific breed icon that adorns the end of the chain. Each Key Chain comes with an attractive header card with a photo of the specific breed. Perfect for gift giving! Average total length of 3.75 inches. Please note: charms may vary slightly in size and shape from what is pictured. If minor details are important please call.